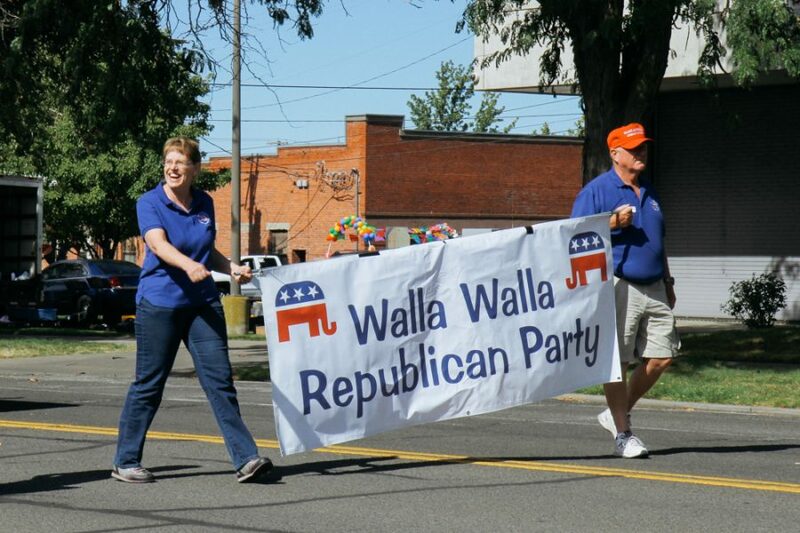 If you walked by the Walla Walla County Republican Headquarters in the red brick building on Second Avenue last week, you would not have found a soul there. Travel about a mile south though, and you would have found, amid the smell of fried dough and the mechanical whirs and jerks of a dozen carnival rides, both the Republicans and Democrats in one place–the County Fair. By ensuring a steady source of what both political parties work hard to reach–voters–the Fair makes an irresistible location. 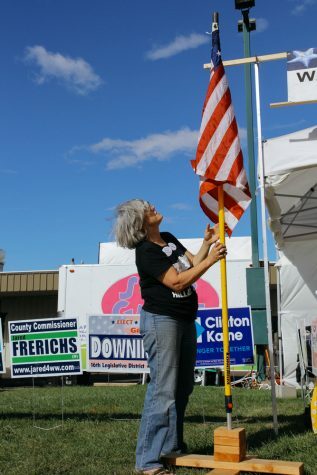 The Walla Walla County Democrats are no strangers to following the crowd, whether that means setting up shop at the County Fair or holding office hours at Heritage Park. 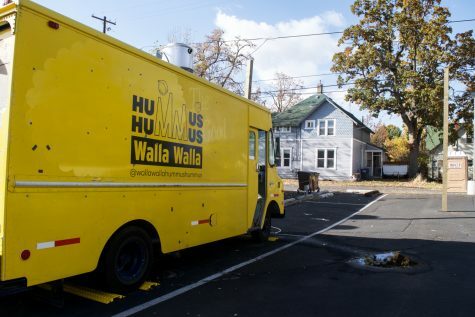 When the building they previously used as an office was sold by the building’s owner three years ago, the group began searching for a solution. Rather than rent a space on expensive Main Street, the Democrats decided to eschew a fixed location entirely and travelled to different locations and events around town in their ‘pop-up office.’ This year, the group has used their mobile office to hold regular hours on Tuesdays, Thursdays and Saturdays at Heritage Park, which will resume after the county fair. The pop-up office, explained Steve Schmidt, the chair of the Walla Walla County Democrats, allows the party to be “highly visible.” Getting seen and heard are especially important for Democrats operating in a more conservative area like Walla Walla where not everyone knows that the Democrats are such an active group. 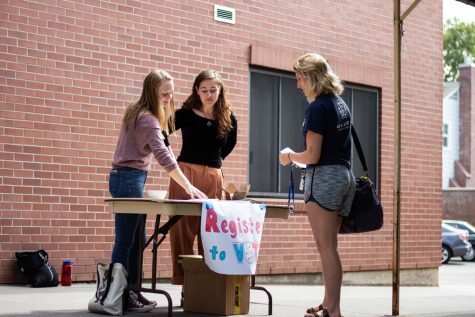 Facing a Republican-dominated county, one of the main focuses for the Walla Walla Democrats this election cycle is increasing their representation in local offices. “We’ve got two Democrats running for County Government,” Schmidt said. “That’s the first time that’s happened in fifteen years.” Democrats Randal Son and Jared Frerichs are running for the two open spots on the County Commission. While Son won his primary with about 25 percent of the vote, Jared Frerichs came in second to Republican challenger, Jim Johnson. Before I leave the fairgrounds to attend the annual County Fair parade downtown, I stop by the Democrats’ booth (the Republicans’ is not open yet) and find a woman named Nancy Monacelli, the treasurer of the County Democrats. She is rolling up the plastic white siding of the booth before she heads out to the parade, revealing the abundance of pins, signs, t-shirts and even pocket constitutions within. “We’re really seeing a lot of growth, not just in the party but in support for those progressive ideals,” Monacelli says. 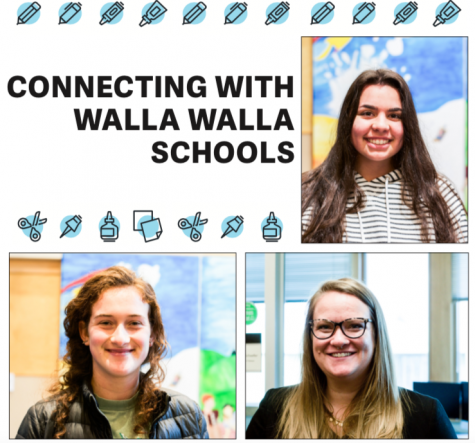 Monacelli identifies Walla Walla’s growing Hispanic population as one of the key sources of support for the Democratic party here. But, according to Monacelli, it’s not just Hispanics or other minority groups that are turned off from Republican rhetoric this election cycle. “What I’m seeing a lot is that people who have always identified with the Republican party really feel that their party’s moved away from them … the party’s gone so far hard right,” Monacelli says. One reason Monacelli believes Republicans continue to receive more votes in the county is that “people reflexively vote for the guy with the ‘R’ after their name.” She and the county Democrats aim to change that. “One of the things that’s really been a concerted effort in the last year is to make it socially acceptable to be a Democrat in Walla Walla.” Monacelli says to achieve this goal the group has been working throughout the primary season to increase visibility by hosting events like candidate meet-and-greets. Throughout the interview, Monacelli has been bustling around the booth, smoothing shirts, arranging pins and even having a conversation with a 16 year old student from a local high school. “And now I’ve got to run back to the parade,” she says. I pick out the County Republican float from among a stream of immaculately groomed horses and also immaculate former county fair queens and spot Dan Nims, the chair of the county Republicans, chatting with some local candidates. 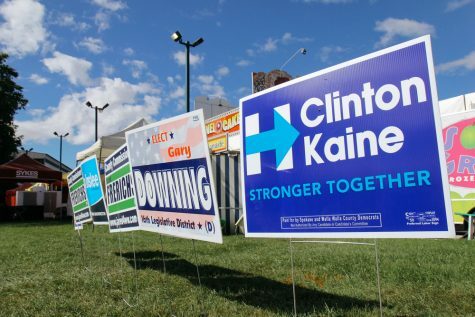 Nims, with whom I spoke earlier in the week, told me his party’s main focus at the fair is “helping the electorate become familiar with candidates.” While most voters are well-versed in national candidates, “there’s lots of other down-ballot candidates with which they have little familiarity,” added Nims. In addition to passing out literature on their party members running at the county and state levels, the Walla Walla Republicans use their time at the fair as a “meet and greet,” Nims said, giving voters “the opportunity to talk to the party.” Indeed, Cathy McMorris Rodgers (R), the U.S. Representative for Washington’s 5th congressional district, chatted with some volunteers in front of the float. When the parade finally begins, each float takes turn filing out of waiting spots along Fifth Avenue to join the main route moving east along Alder Street toward Palouse Street For a time they are all part of the celebration: the County Democrats waving in the back of a blue pickup, a high school band marching in synchronicity, the Rollergirls gliding by in fishnets, an instrumental ‘Amazing Grace’ trails a veterans’ float, the Republicans atop their white and red chassis. When they reach Main Street they’ll travel west to Fifth Avenue and south on Chase until they reach–where else? The Fairgrounds. Murray, Washington’s Senator since 1992, will seek a fifth term this cycle. Murray is considered a reliable vote for the Democratic party in Congress. A few of the issues she strongly supports include the expansion of Obamacare, higher taxes on the wealthy and the prioritization of green energy. Vance became one of the first candidates for Senator in the nation to formally denounce Trump in May 2016, but it’s unclear whether his “Never Trump” stance will hinder or help him in the general election. Vance received roughly half the percentage of votes (27 percent) as his opponent Murray in the August primary. Key issues for Vance include reducing the national debt, producing more middle class jobs and creating an alternative to the Affordable Care Act. 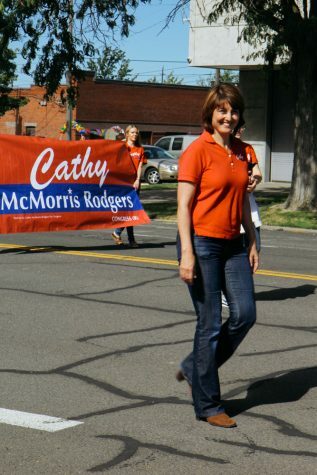 Rodgers has served as the U.S. Representative for Eastern Washington since 2004. Rodgers won the 2016 primary with 42 percent of votes, which is 10 percent lower than the 2014 primary. Rodgers strongly opposes expansion of the Affordable Care Act and prioritization of green energy. She favors absolute right to gun ownership. The Democratic challenger Pakootas, a Native American who grew up on the Colville Indian Reservation, received 31.5 percent of the vote in the August primaries. Pakootas supports campaign finance reform and equal access to education. Inslee has served as governor of Washington since 2013. He won the 2016 primary with 49.30 percent of the vote. Inslee is largely running on his past accomplishments which include the Early Start Act, a measure to increase access to early learning and a tuition cut for students at state and community colleges. Bryant, the Republican challenger, received 38.33 percent of the primary vote. Bryant served as Port of Seattle Commissioner for King County from 2008-2015. As governor Bryant wishes to place a hold on new regulations until existing regulations are reevaluated. Incumbent Wyman, Washington Secretary of State since 2012, received 47.9 percent of the August primary vote. While voter turnout has fallen slightly under her term, Wyman has said she does not believe turnout is her part of her job as Secretary of State. Democratic challenger Podlodowski received 46.13 percent in the primary and unlike Wyman, Podlodowski is highly interested in lowering barriers to voting through automatic voter registration and prepaid postage on voting ballots.